I want to light up my Lego buildings, where can I buy some LED bricks? You can buy a set of 8 Light Up Building Bricks (2×3) with On/Off and Dim Ability. Tight Fit with all LEGO bricks: No longer do the lighted bricks have to be rare and one per set. Get 8 in one place with this new, patented design. These bricks can easily be turned on or off, or even dimmed, for eye-popping displays. They have some details though. The LED inside the clear brick is facing up. This means most of the light goes up, and only a little goes out the sides. Last the lights come with two technics pins, used to turn the screws to turn the lights on or off. They also come with one green brick remover, that is a bit longer than the LEGO brick remover. 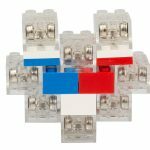 Buy 8 LEGO compatible LEDs for less than $10 delivered to your place! This entry was posted in Toys & Games and tagged bricks, led bricks lego, led lights, lego, lego bricks, lego led, light up on June 14, 2017 by WhereCanWeBuy.